Copyright © 2013 Lazare Kouakou Kouassi et al. This is an open access article distributed under the Creative Commons Attribution License, which permits unrestricted use, distribution, and reproduction in any medium, provided the original work is properly cited. This study aims at characterizing the physical environment and suggesting solutions for a better management of the hydro-agricultural dam of M’Bahiakro which is being constructed over the N’Zi River and is the first inflatable dam in Côte d’Ivoire. 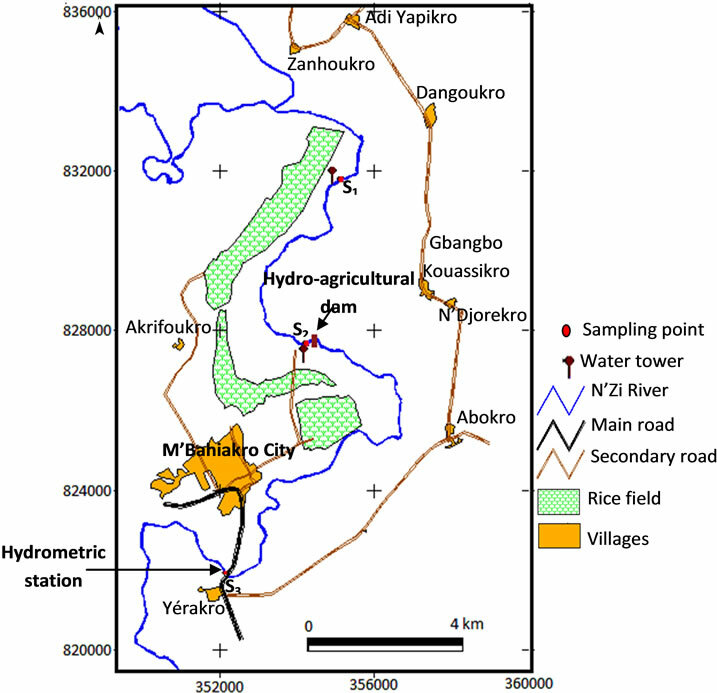 In this survey, data related to hydrology, characteristics of the dam and the irrigated rice production area were obtained with the Water Resources Agency and the National Office of Rice Development of Côte d’Ivoire. Physicochemical parameters of the N’Zi River were collected seasonally at three monitoring stations. 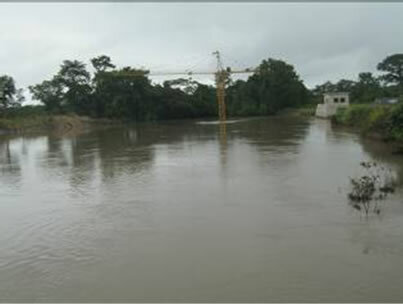 Results showed that the N’Zi River is characterized by a high water level period from April to November and a low water level period from November to April. The gap between the low flows and the high flows is important (about 206 m3/s on average). The annual average flow is 40 m3/s with a standard deviation of 32.52 m3/s and a variation coefficient of 0.88. The SAR average value (1.63) and the average conductivity (78.44 μS/cm) showed that waters of the N’Zi River are of high quality to be used for irrigation. Suspended sediment concentrations do not present significant difference along the river. But the seasonal variations are important; they are higher during the rainy seasons (45.8 mg/L on average) than in the dry seasons (17.7 mg/L on average). The annual solid flux of the N’Zi River is 41897 tons, i.e. 15810 m3 of sediments. The annual sediment flux is important and can lead to high depositions in the line-shaped reservoir of the dam and that calls for attention to control the silting up of the reservoir. Great efforts concerning interdisciplinary approaches, as well as extensive and intensive field work are needed in order to better manage the hydro-agricultural dam of M’Bahiakro. Agricultural sectors in Côte d’Ivoire, as in many developing countries, still have the center role in improving the rural economies. In order to achieve food self-sufficiency, Ivorian government is implementing a new program called National Rice Program (PNR) to increase rice production. The national production in rice of Côte d’Ivoire covers only about 50% of the needs of the Ivorian population . The aim of the National Rice Program is to increase rice production by improving irrigation, drainage and management systems. Thus, this program plans to build several dams to support on-farm level irrigation development and management on dry season rice production in the main irrigated rice production areas. The reference  revealed that improving irrigation and drainage systems and management is particularly important to increase and stabilize agricultural production. However, the construction of dams over rivers disturbs their drainage regimes [3-7]. M’Bahiakro is a town in Côte d’Ivoire whose economy heavily depends on the agricultural sector. The National Rice Program is constructing a dam in M’Bahiakro over the N’Zi River in order to promote increased production of paddy rice to ensure food security and to generate revenues for the local population. 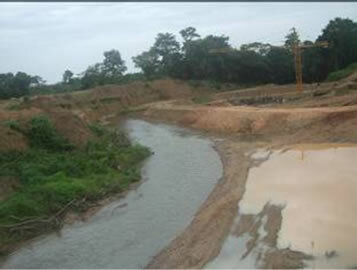 The construction and the filling up of the hydro-agricultural dam of M’Bahiakro are expected to end in 2013. This dam is the first inflatable dam in Côte d’Ivoire and thus differs from previous existing dams. In its operation, it is to be submerged during high water periods. However, like the other reservoirs of Côte d’Ivoire, authorities didn’t plan any strategy to collect continuously data relating to hydrology and sedimentology in order to simulate the hydrodynamic and sedimentological functioning of the reservoir and the downstream river in the future. And yet, some research activities revealed that the fluctuations in the rainfalls and the flows over the watershed of the N’Zi River are very significant . In Côte d’Ivoire, after the severe drought of the 1970s, more than 578 reservoirs had been constructed to improve water supply, electricity, agriculture and cattle . But, most of those reservoirs (around 25% of them) no longer work properly because they are being filled with sediments. In fact, generally, agricultural activities, rapid and uncontrolled urbanization are increasing suspended sediment yield and affecting the morphology of surface waters . The accelerated filling up of the reservoirs provokes floods, significant modifications of the physicochemical parameters and a fast development of aquatic plants . So controlling suspended sediments by predicting their concentrations and their transport and fate in rivers and reservoirs is of vital importance to their management [12-14]. To better manage the hydro-agricultural dam of M’Bahiakro, it is necessary to have a database for modeling the hydrodynamic and sedimentological functioning of the reservoir as well as possible. The aim of this paper is to characterize the physical environment and suggest solutions for a better management of the hydro-agricultural dam of M’Bahiakro. The study site is an irrigated area, located at about 6 km of M’Bahiakro city, on the catchment of the N’Zi River which is a tributary of the Bandama River (Figure 1). Figure 1. Location of the hydro-agricultural dam of M’Bahiakro. project flow (Q30) is 610 m3/s. The hydrological data used in this study were obtained with the Water Resources Agency and the National Office of Rice Development of Côte d’Ivoire (hydrology, characteristics of the dam and the irrigated rice production area). The rainfall data cover the period from 1990 to 2004 and the N’Zi River flows from 1960 to 2004. Field observations consisted in making in-situ measurements in the N’Zi River and collecting water samples for analysis. Samplings were made according to hydrological seasons. Thus, field observations were made in February 2012 (long dry season), June 2012 (long rainy season), August 2012 (short dry season) and October 2012 (short rainy season). Water samples were taken from three (03) monitoring stations. 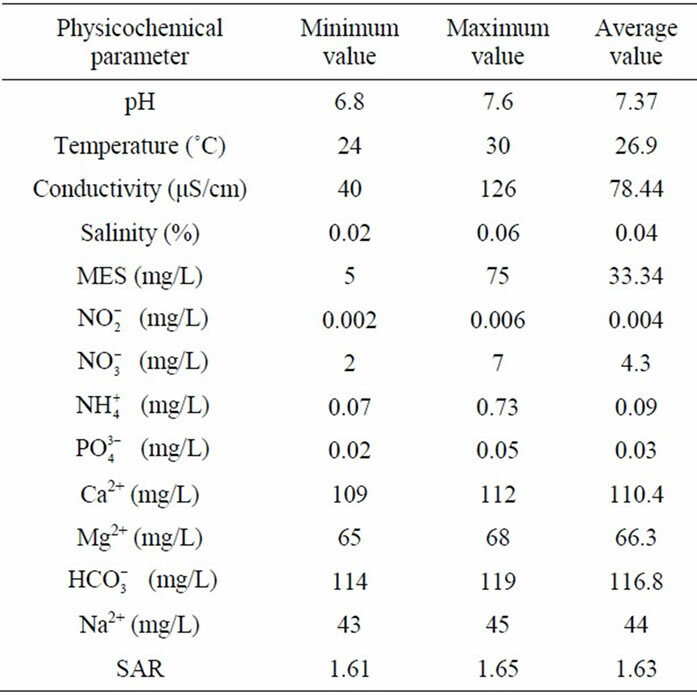 The physicochemical parameters (pH, temperature, electrical conductivity and Salinity) were measured in-situ using a multiparameter HANNA 9828 probe with 20 m cable. Samplings were made at the dam, upstream and downstream the dam (see Figure 1). Water samples were also collected in plastic bottles for analysis at the laboratory. These bottles were washed and rinsed several times with deionized and sample water before sample collection. The samples were transported to the laboratory in ice chest and stored at 4˚C prior to analyses. In the laboratory, nitrate, nitrite, ammonium, sulphate and phosphate were analyzed by spectrometry according to AFNOR standards NFT 90-013, NFT 90-012, NFT 90-015, NFT 90-040, NFT 90-023, using a JASCOV-530 molecular absorption spectrometer controlled by a computer. Sodium, calcium and magnesium concentrations were measured using atomic absorption spectrometry, according to AFNOR standards NFT 90-020, NFT90-003 and NFT 90-112 . Suspended sediment concentrations were determined by filtering the samples through 0.45 μm millipore filters and then determining the ovendried weight of the filtered sediment. where QSS is the seasonal suspended sediment discharges (kg/s or t), QL is the seasonal river flow (m3/s), C the seasonal suspended sediment concentration (g/L) and dt the time (the length of the season). Finally, the annual suspended sediment discharge in the reservoir was obtained by adding the seasonal discharges. The SAR provides a classification of water cation chemistry as it pertains to its usefulness for irrigation [19,20]. The SAR was coupled with the conductivity to distinguish the different categories of water . So waters were classified in terms of salinity hazard (conductivity) and sodium hazard (SAR). 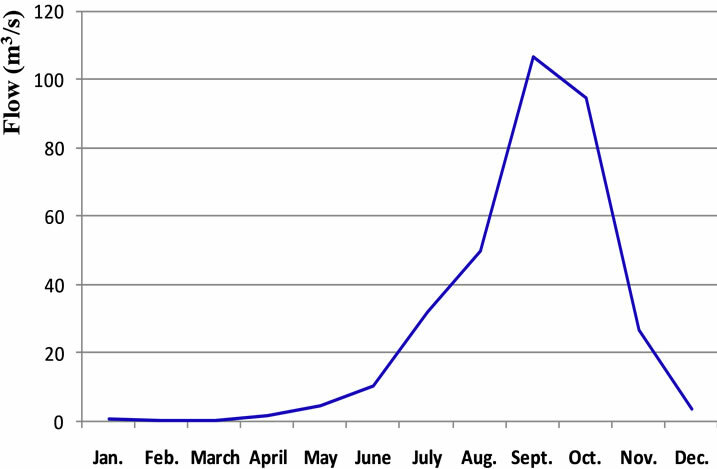 The annual variation of rainfall in the region of M’Bahiakro is illustrated in Figure 2. The rainfall is more important from April to June (120 - 150 mm) and from September to October (105 - 155 mm). In contrast, the rainfall is less important from November to March (0 - 50 mm) and from July to August (80 - 90 mm). These variations in the rainfall allow identifying four climate periods composed of two rainy seasons and two dry seasons. The annual average rainfall is 1000 mm with a standard deviation of 231 mm and a variation coefficient of 0.21. Figure 2. 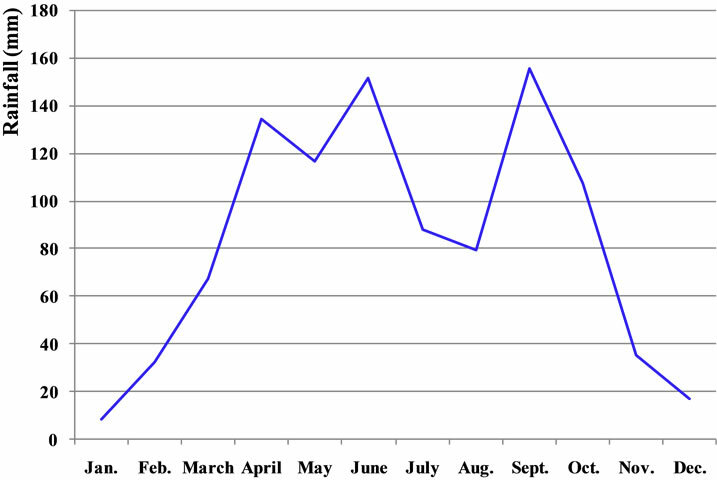 Seasonal average variation of the rainfall in M’Bahiakro from 1990 to 2004. Figure 3. Seasonal average variations of the flows of the N’Zi River at the hydrometric station of M’Bahiakro from 1990 to 2004.
from November to April. The maximum flow of the N’Zi River is recorded during September-October with an average flow rate of 105 m3/s. The flow submerged the site of the dam during high water level period from June to November (Figure 4). 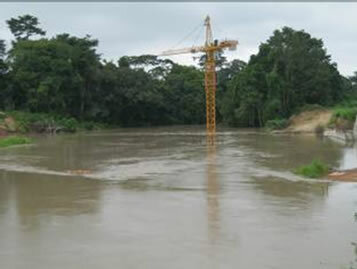 Water level rose up to the top of the constructing dam about 10 m in October 2012. The banks of the river on the site of the dam are sandy and high quantities of sand and detritus materials were dumped on the banks during the construction of the dam (Figure 4(a)). The flows at the hydrometric station of M’Bahiakro as well as the rains are irregular. The flows have decreased till the 1970s and are still low compared to those of the 1960s (Figure 5). The seasonal variations showed that the gap between the low flows and the high flows is important. For example, maximum flows were 447 m3/s, 646 m3/s and 394 m3/s respectively in 1963, 1968 and 2003 while the minimum flow was about 0.01 m3/s. The gap between the low flows and the high flows is about 206 m3/s on average from 1990 to 2004. The annual average of the flow is 40 m3/s with a standard deviation of 32.52 m3/s and a variation coefficient of 0.88. The physico-chemical parameters measured at the three sampling points in the N’Zi River around the hydro-agricultural dam of M’Bahiakro do not present significant difference along the river. Overall, the physicochemical characteristics of the N’Zi River fluctuate as follow (Table 1). Figure 4. Water level evolution on the site of the hydroagricultural dam of M’Bahiakro relating to the hydrological seasons. (a) long dry season (February 2012); (b) long rainy season (June 2012); (c) short rainy season (October 2012). Table 1. Variations of the physicochemical parameters of the N’Zi River at the hydro-agricultural dam of M’Bahiakro. Figure 5. 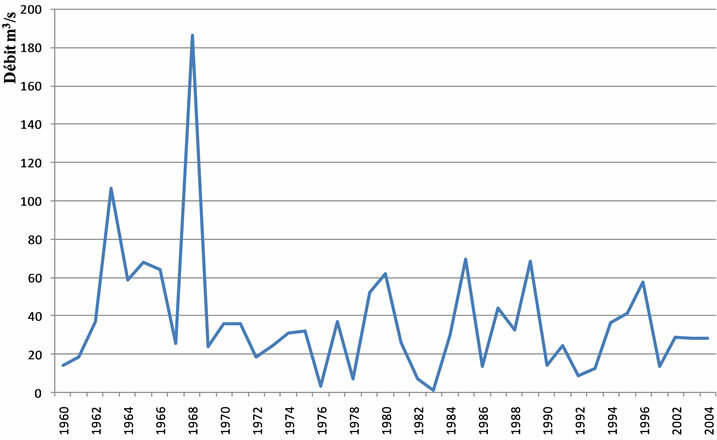 Annual variations of the flows of the N’Zi River at the hydrometric station of M’Bahiakro from 1960 to 2004. The N’Zi River has a mean pH close to neutral (pH = 7.37) with temperatures ranging between 24˚C and 30˚C. Suspended solids concentration (SSC) in the water range between 5 and 75 mg/L. Nutrients for plants: , , , have average concentrations of 0.004 mg/L, 4.3 mg L, 0.09 mg/L and 0.03 mg/L respectively. According to the SAR average value (1.63) and the average conductivity (78.44 μS/cm) waters of the N’Zi River belong to class C1-S1 corresponding to the waters of high quality for irrigation. Table 2. Suspended sediment concentration of the hydroagricultural dam of M’Bahiakro. seasons (45.8 mg/L on average) than in dry seasons (17.7 mg/L on average). The annual solid flux of the N’Zi River is about 41897 tons, i.e. 15810 m3 of sediments. The inflatable dam of M’Bahiakro is designed to promote increased production of food crops and especially paddy rice to ensure food security and to generate revenues for local populations. The reservoir of this dam will be used to irrigate a rice production area. However, the project gives the possibility to practice the growing of rainfed rice. Then, the analysis of the rainfall conditions for the practice of the growing of rainfed rice indicated that the central part of the N’Zi River basin, where is located the irrigated area of M’Bahiakro, is in the equatorial attenuated transition regime characterized by two rainy seasons and two dry seasons: a long dry season from November to March, a long rainy season from April to June, a short dry season from July to August and a short rainy season from September to October. So, favorable periods for the practice of the growing of rainfed rice are the two rainy seasons during which there is enough rainfall for the plants. However, the flows in the project area as well as the rains are irregular. The runoffs of the N’Zi River have decreased till the 1970s and are still low compared to those observed in the 1960s. The reference  revealed that rainfalls and flows over the catchment of the N’Zi River are continuously decreasing due to climate change. From 1968 to 2004 flows decreased by 49 p.c. The hydrology of the N’Zi River presents high variations between low water level and high water level. In the last two decades the minimum flows reached 0.01 m3/s while the maximum flows reached 394 m3/s. So it is important to pay attention to hydrological data for a better management of the dam. The study of the physicochemical parameters permitted to estimate that the SAR average value is 1.63. According to the SAR value and the average conductivity (78.44 μS/cm) waters of the N’Zi River belong to the class C1-S1, waters of high quality which can be used for irrigation on almost all types of soil . The variations of the suspended sediment concentration were closely related to the hydrological seasons in M’Bahiakro Region. Suspended sediment concentrations are higher during the rainy seasons where rainwater carries more particles than in dry seasons. The references  and  showed that there is a strong correlation between suspended solids loads and flow variations. The suspended sediment concentrations of the N’Zi River at the irrigated area of M’Bahiakro are higher (32 mg/L on average per year) than those (12 mg/L per year) observed in Lake Taabo over the Bandama River . 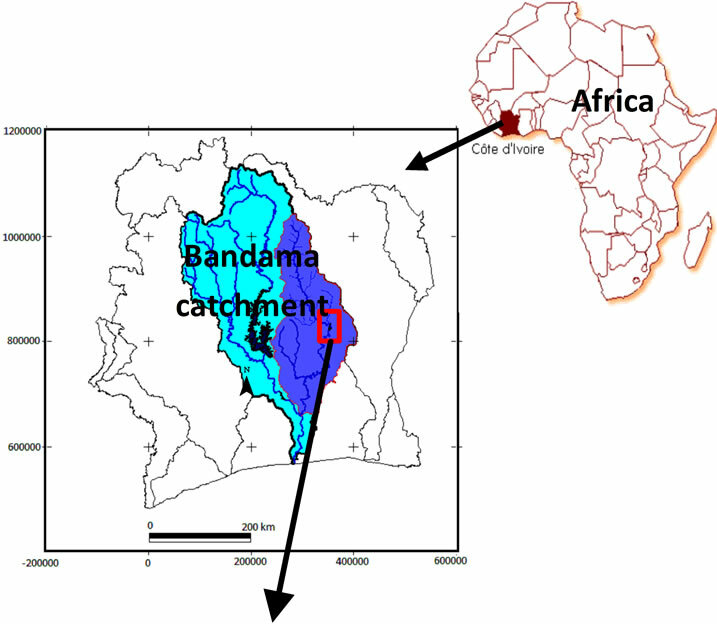 The low concentrations of suspended sediments recorded on the Bandama may be attributed to the large number of reservoirs (183) in the northern part of the basin. Most of the small reservoirs in the northern part of the Bandama River are menaced by silting phenomena and no longer work properly. The accelerated filling up of those small reservoirs is related to the small size of their catchment which allows rainwater to rapidly reach the small rivers, like the N’Zi River, with their solid loads which can be trapped by the dams. Although the capacity of the reservoir (2.76 × 106 m3) of M’Bahiakro seems important, its geometry: 7 m in width (river bed section), 30 km in length and 5 m in depth on average can provoke high depositions near the dam regarding the annual average sediment flux (15,810 m3/year) which is important for the line-shaped reservoir of the dam. The deposition rate will also depend on the management of the dam and the N’Zi River catchment. Thus, it is of great importance to plan the control of solid transport towards the reservoir to avoid its rapid filling up by sediments. Also, the banks on the site of the dam need to be protected for the banks are sandy and high quantities of sand and detritus materials were dumped on the banks during the construction of the dam. The reference  revealed that the landslide from the banks can highly increase sediment yield in a reservoir. Many research works confirmed that controlling suspended sediments by predicting their concentration and their transport and fate in rivers and reservoirs is of vital importance to their management with respect to the maintenance of dams, turbidity, pollution and reservoir silting [12-14,24-27]. But in Côte d’Ivoire, the lack of forward-looking studies on the hydrology and the morphology of the reservoirs renders their management difficult. The reservoir’s managers cannot understand and manage efficiently the water level fluctuations. In addition to examining the current status of the irrigated rice production area of M’Bahiakro, this study provides information that future studies can use to evaluate further changes of the N’Zi River. Our analysis can be used to develop a scientific basis for environmental protection of the inflatable dam of M’Bahiakro and a policy for rational water use. This study revealed that the hydrology of the N’Zi River presents high variations between low water level and high water level. Minimum flows reach 0.01 m3/s while the maximum flows are 394 m3/s. The analysis of the physicochemical parameters showed that the N’Zi River is good for irrigation. However, concerning the suspended sediment loads, the annual average sediment flux (15,810 m3/year) is important and can lead to high depositions regarding the line shape of the reservoir. So, it calls for attention to controlling the silting up of the reservoir. ● Develop numerical simulation to predict future evolution of the dam area in order to help decision makers in water resource management. This research was supported by the International Foundation for Science (IFS, Sweden). We are grateful to this institution for its financial contribution to our work. B. T. A. Goula, I. Savané, B. Konan, V. Fadika and G. B. Kouadio, “Impact de la Variabilité Climatique sur les Ressources Hydriques des Bassins de N’zo et N’zi en Côte d’Ivoire (Afrique Tropicale Humide),” VertigO, Vol. l7, No. 1, 2006, 12 p.
JICA (International Japanese Cooperation Agency), “Plan Directeur de Gestion des Ressources en eau en Côte d’Ivoire: Rapport Final, Rapport Principal. Agence Japonaise de Coopération Internationale,” Cabinet du Premier Ministre, République de Côte d’Ivoire, 2001, pp. 5-11. K. L. Kouassi, D. L. Goné, N. H. Mélèdje, A. V. I. Wognin and K. Aka, “Hydrologie et Evolution Spatio-Temporelle des Charges Solides en Suspension Dans le lac du Barrage Hydroélectrique de Taabo (Côte d’Ivoire),” European Journal of Scientific Research, Vol. 18, No. 3, 2007, pp. 463-476. J.-C. Winterwerp and W. G. M. Van Kesteren, “Introduction to the Physics of Cohesive Sediment in the Marine Environment,” Developments in Sedimentology, Vol. 56, 2004, 466 p.
S.-H. M. Hsu, “Lessons Learn from a Water-Shortage Disaster in North Taiwan Due to a Typhoon Event on Reservoir Operation,” 3rd WFEO-JFES-JSCE Joint International Symposium on Disaster Risk Management Proceedings, 2009, pp. 37-40. AFNOR, “Qualité de l’Eau: Environnement, Association Française de Normalisation,” 1st Edition, AFNOR, Paris, 1994, 861 p.
S. A. Young, N. Futoshi and M. Shigeru, “Hydrology, Suspended Sediment Dynamics and Nutrient Loading in Lake Takkobu, a Degrading Lake Ecosystem in Kushiro Mire, Northern Japan,” Environmental Monitoring and Assessment, Vol. 145, 2007, pp. 267-281. T. Y. Brendan and N. M. Gasparini, “Hydrologic Controls on Wash Load Sediment Concentrations within a Low-Ordered, Ephemeral Watershed,” Journal of Hydrology, Vol. 410, No. 7, 2011, pp. 3-83. US Salinity Laboratory, “Diagnosis and Improvement of Saline and Alkali Soils,” USDA Agriculture Handbook 60, US Government Printing Office, Washington, D.C., 1954, pp. 10-50. T. Lulseged, A. Assefa, A. Ermias, W. Kifle and P. L. G. Vlek, “Estimating Sediment Yield Risk of Reservoirs in Northern Ethiopia Using Expert Knowledge and SemiQuantitative Approaches,” Lakes & Reservoirs: Research and Management, Vol. 16, No. 4, 2011, pp. 293-305.